For week 6, I tried something new using LEGO, lighting, and a beastly dog toy. Since the start of the year, Ive been participating in a weekly photography challenge in an attempt to improve my photography. Although I shared them on Flickr, I wasnt blogging about them. Perhaps it was because of a lack of confidence of their quality, not liking their originality, or just fear of ridicule. Overcoming all that, Id like to share last weeks photo. Its all about fun! The challenge Im using is from Dogwood Photography. It is a 52 week challenge, their third year running. The goal of last weeks photo was vision: alternating rhythm. The challenge was to use alternate patterns of light to bring depth and rhythm to the photograph. I was lost for awhile, trying to figure out what to do. I actually took a couple of different photos, but wasnt happy with the result. Then, while playing with the dogs, I came up with an idea. 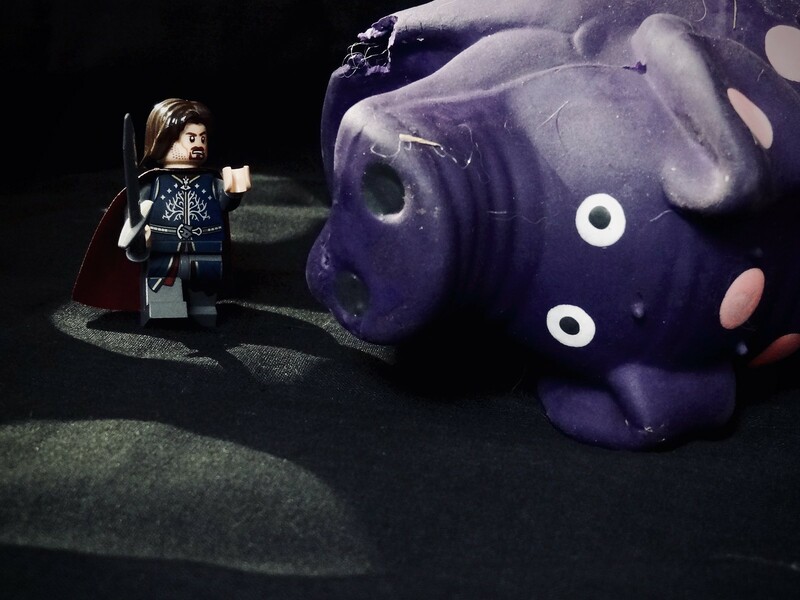 The cute purple and pink polka dotted pig was the prefect beast to use in a scene. I was planning to leverage one of many LEGO mini figures as the key to the scene. I landed on this Aragorn from an old Hobbit set. Yet, the scene wasnt the key. it was the lighting. In my head, I wanted a darkened scene with circles of light illuminating the battle. I had the idea pretty well thought through, but wasnt sure how to light the scene. Again, inspiration struck. This time, I was doing laundry. While folding the clothes, I wondered about the holes in the basket and if they would work. Although they arent quite circular, theyll do for what I need. Im kicking myself of not taking a picture of the setup. But, Ill do my best to describe it. I started by creating a base and covering it with a dark blanket. This will become the floor for the fight. I then placed the beastaka pigon it, and then positioned the warrior. The next step was to setup the lighting. I positioned the laundry basket on a box to give it height. I used my iPhones camera flashlight to light the holes. I attached it to an tripod and positioned it until circles of light matched what I wanted. The last step was the hardest. Placing my Sony camera on a tripod, I starting snapping pictures. Nothing looked quite right, so I kept moving things around. I tried different angles, different lighting, different positions. In the end, I landed on the image above. A bit of fun, a bit silly, and it fits the lighting challenge I was given. Mission accomplished. Now, about this weeks photo.